When traveling internationally to places that have other types of power points and plugs, we always have the dilemma of having the right adapter. That Extension Cable is heavy — bad for travel — and requires a 3-prong outlet/socket — often difficult during travel outside of the US. Due to both of these issues, I left that cable at home. Then there is an issue with the small American-style 2-prong piece because the big white brick often slides out of the wall outlet. 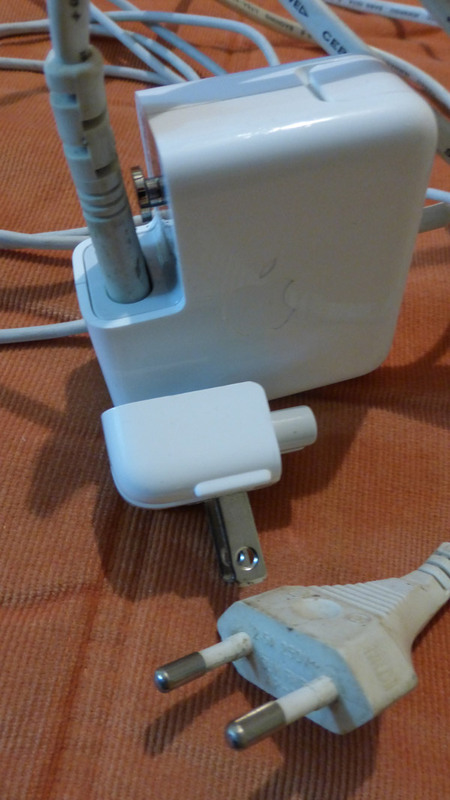 Add an international adapter to the American-style prongs and the brick is certain to slide out of the adapter. Look at the length I went to in order to not have that happen! 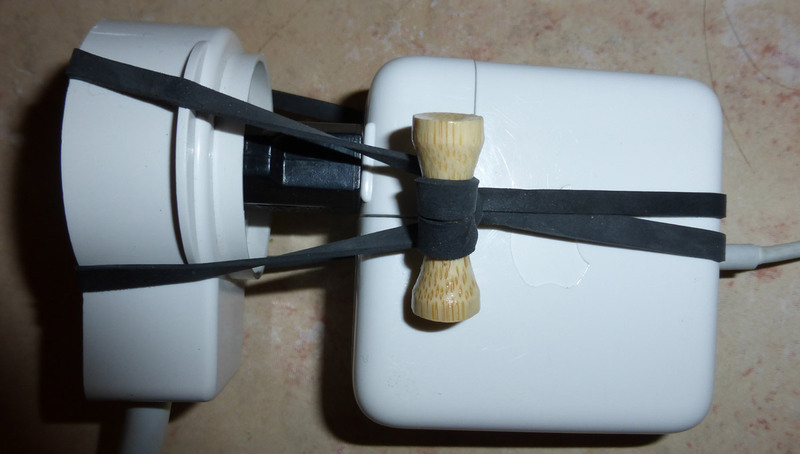 I had to use an extension cord to remove the wall issue, then use a Bongo Tie to keep the combo in place. And even that was precarious. Here is the solution to flexible travel with your MacBook! You might think I am going to tell you about some brand of other country’s power plug that fits into the Apple Power Adapter. Indeed, they do exist. But they are bulky and don’t provide extra length to enable you to move away from the wall socket. Instead, the solution is as simple as a spare generic cable for the country you’re visiting! A generic C-7 — aka “Figure 8” — unpolarized (unpolarized) plug that goes into a printer, PC power adapter, CD player, old cassette tape recorder, or such actually works to power your Mac power brick! They cost about $5 in most countries. The UK version is closer to $10 because it’s a more intricate plug. I know you’re wondering. Yes, it is safe. In late 2014 was given this tip by engineers at Delta, the company that designed and builds that power supply for Apple. I’d always assumed — (not wise to do!) — that the metal stub in the brick was there to block us from using a different power cord. But it’s not! That metal stub was actually designed to a height that allows us to use an alternative power cord! Incredulous, I questioned the Delta team. If we’re using an unpolarized (unpolarized) plug, then are we losing grounding that we should have? I was assured by them that the only difference is that, at times we might feel a bit of a tingle where we rest our wrists. I started using C-7, Figure 8, extension cables in September 2014 and as of May 2017, I have only felt that tingle on my 11″ MacBook about 8 times, always when I was very tired and/or my hand was wet. Working on a 15″ or 17″ in Germany in 2014, I felt that tingle a bit though and a friend who uses the larger Macs also reported tingling. He was never bothered by it. Even when I am back in the US with my Apple Extension Cable, I carry a generic Figure 8 in the day bag I take on the go. 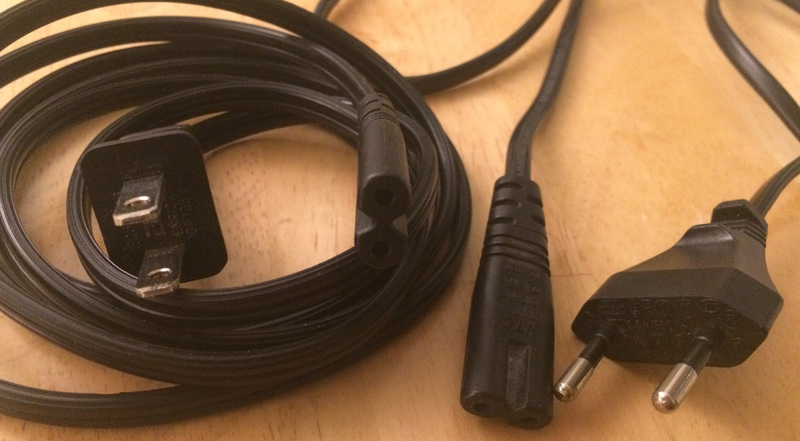 Here’s what the C-7, aka Figure 8 power cord looks like. These are my USA and my Israel cords. Wow! Great info and just in time. I’m planning a trip to Spain and this will certainly come in handy.